Glenna Jean Manufacturing is one of the highest quality manufacturers of baby bedding available today, and the oldest privately held infant bedding company in the U.S! 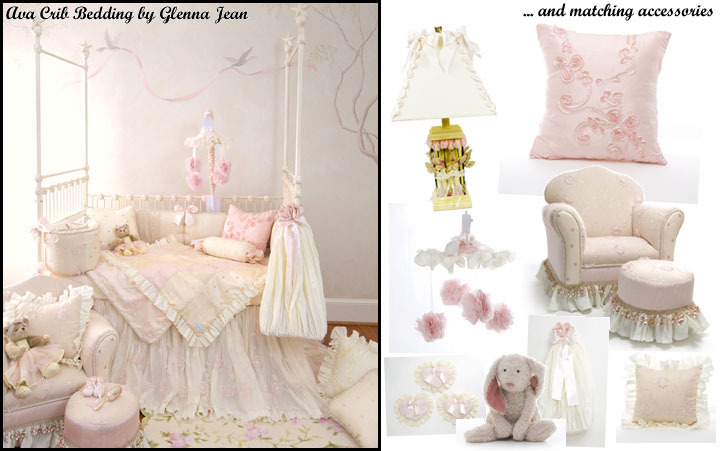 Glenna Jean offers many nursery bedding sets as well as twin, full and queen bedding for big kids! with a veriety of bedding styles from conventional colors and patterns to traditionalist. Glenna Jean’s nursery bedding sets are stunning with a variety of patters for boys or girls you are sure to find the perfect bedding set to create a great nursery or big kid room. The Ava Bedding set is available in nursery bedding as well as twin, full and queen ! With tons of matching accesories available. Royal Bambino’s retail storefront located in Murrieta, CA is now offering a new item: Crib Mattresses from Colgate, The Crib Mattress Specialist! Colgate has been producing quality mattresses entirely Made in America since 1955, and their mattresses are recognized as some of the highest quality in the country. The universal crib mattress fact is that firmer is better for your baby. If a mattress feels comfortable to you, it is too soft for your baby! Babies’ bones are softer and need more support for their growing bodies, so for your baby you should buy the best quality mattress you can afford. Colgate makes 7 different Innerspring Crib Mattresses, including the 2-in-1 Innerspring Mattress, the most popular mattress they’ve introduced in over 50 years! The 2-in-1 mattress has Dual Firmness, meaning one side is extra firm for an infant and the other side less firm for a toddler, as well as 150 coils, natural coir fiber insulation, and a triple-laminated nylon-reinforced wetproof cover. This mattress is ideal for cribs that convert into toddler or day beds, as your toddler will get lasting comfort from this high quality mattress. Colgate’s leading Foam mattress is the Classica I, which has been recommended in Baby Bargains for more than 14 years straight and has since become the industry standard for foam crib mattresses. It includes extra-firm foam, non-allergenic triple-laminated anit-dust vinyl cover, square corners for a snug fit in the crib, and is lightweight. Foam has an advantage in that it is the lightest weight type of crib mattress, weighing less than 8lbs as opposed to over 30lbs for a high quality innerspring mattress. Foam provides a solid, firm surface for baby to sleep on; as a plus, toddlers tend to jump less on a foam mattress than on bouncy springs! Colgate makes Natural and Organic crib mattresses from both innersprings and foam. Royal Bambino likes the Eco-Classica I, as firm and durable as the foam Classica I, but made with foam from renewable, sustainable plant-based materials. The manufacturing process uses less energy and reduces carbon emissions into the atmosphere. Many organic mattresses do not include a waterproof cover, but the Eco-Classica I features a damask cloth sleep surface with a wetproof backing. Whether you choose an Innerspring, Foam, or Organic Mattress, always buy the firmest and highest-quality mattress available for your baby’s health and well-being. Come in to Royal Bambino‘s retail store Monday – Saturday 10am – 6pm Pacific to take home a quality Colgate Crib Mattress today! It has been said that everything old comes around again, and we can see this is true even in nursery bedding. A retro nursery can be achieved easily through just a few simple colors, patterns, or prints based on classic styles. Many manufacturers have created contemporary nursery bedding collections drawn from retro and vintage design. Here are several nursery bedding collections based on styles and colors from days gone by. The easiest way to bring the past into the modern nursery is with a nursery bedding collection featuring a vintage print. The Vintage Toys crib bedding set by Cottage Dreams has a crib bumper featuring classic cars, trains, planes and boats in a bold red and blue collection. Your baby will sleep like a princess in chic Vintage Floral nursery bedding by My Baby Sam, a sweet set with polka dots, stripes, and soft vintage flower print in pink and white. For an edgy alternative print, consider Tattoo nursery bedding by Fairy Tale, depicting classic tattoo flash complemented by soft midnight blue minky, for the ultimate in vintage prints. A vintage print will instantly call to mind past ages and create a retro feel for your baby’s nursery. Retro patterns often include circles, polka dots, or paisley in their designs. Retro Circles nursery bedding by Hoohobbers is a prime example of retro patterned nursery bedding, with bubbly circles in 70s-themed pinks, greens and muted yellows. Glenna Jean offers wonderful retro bedding collections – Wave Length is dominated by a wave pattern in brown and green straight from the past – and Sweet Potato baby bedding also offers several retro nursery bedding sets featuring concentric squares. Vintage flair abounds in Flea Market nursery bedding by New Arrivals, featuring a hanky ruffled crib skirt comprised of individual vintage handkerchiefs sewn together, complemented by blue polka dot bumpers and red ticking ruffles and crib sheet. For a classic look that never goes out of style, try N. Selby’s Garbo nursery bedding collection, an art deco design in simple, sophisticated shades of pink, gold, bronze and brown. There are many bedding collections available in a wide selection of styles inspired by yesterday’s fashions, or mix and match pieces for a custom vintage nursery, like individual polka dot sheets from New Arrivals or any bedding collection, or a vintage cherries blanket from Hula Moon Kids. Retro nursery bedding can easily create a vintage nursery by creating a focal point with nostalgic colors, patterns and designs. Choose vintage nursery crib bedding to bring the best of the past into your modern nursery! 2010 Bananafish Baby Bedding Now Available! New baby bedding is now available to order from Bananafish Baby Bedding! Seven different collections of designer baby bedding have been introduced, including the sophisticated Brooklyn collection, a stunning crib bedding set in solid jewel tones available in 5 different colors! Brianna, Chloe, and Woodland are perfect choices for any little girl in pinks and florals, and Hayden and Logan would work wonders in any boy’s nursery with blues, greens and browns. For that surprise new arrival in your life, the peaceful MiGi Little Tree collection is perfect for boy or girl in its calm turquoise and orange with sweet birds and leaves. For your growing girl, Bananafish also has two new collections of Toddler Bedding based on popular crib bedding sets, Mod Butterfly and Bubble Gum! Browse all of the wonderful options from Bananafish baby crib bedding at RoyalBambino.com! 2010 CoCaLo Bedding Collections Now Available! Four beautiful new collections of crib bedding from CoCaLo, Inc. are now up at RoyalBambino.com! Choose from the adorable and playful Buttons Collection, featuring classic teddy bears in comforting browns and grays; bright and cheerful Orchid Grace, a fun feminine collection showcasing beautiful floral appliques in pink and cranberry; and Selinda, a girls Safari collection featuring a tall giraffe under a calming tree in soft pink and ivory colors, all available from CoCaLo Baby! And from the trusted Baby Martex line comes the neutral Creme Brulee bedding set, a luxe collection with sherpa and velvet textures in a soft and soothing pallette. These stunning new bedding sets are available now, with more being added soon! Browse these and other designer baby bedding collections from CoCaLo, Inc. in our wide selection of baby, toddler, and kids bedding available at RoyalBambino.com!